The only food Charlotte loves more than chicken soup is spaghetti. And by spaghetti I mean spaghetti. She is very particular when it comes to pasta shapes (unlike her mother). 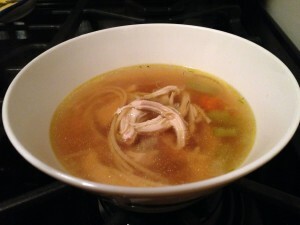 So when I saw this chicken and spaghetti soup recipe, I knew I had to make it for my girl. This is an almost-homemade soup. Sautee some carrots, celery, and onions. Add broth (I used stock) and water. Bring it to a boil and add the spaghetti. Once the pasta is cooked, you add shredded chicken. I used white meat from a store-bought rotisserie chicken. Top with some dill. Super easy and tasty! Charlotte gobbled it up! Heat the oil in a large saucepan over medium-high heat. Add the carrots, onion, and celery and cook until softened, 3 to 4 minutes. Add the chicken broth and 4 cups water to the pan, season with ¾ teaspoon salt and ¼ teaspoon pepper, and bring to a boil. Add the spaghetti, reduce heat, and simmer until tender, 8 to 10 minutes. Stir in the chicken. Sprinkle with dill and additional pepper. Copyright © 2010 weeknightgourmet.com All rights reserved.